Deaths caused by falls in adults more than 65 years old rose more than 30% in the nine-year period from 2007 to 2016, according to a study published in the U.S. Centers for Disease Control and Prevention’s Morbidity and Mortality Weekly Report in mid-May. If this statistic has affected your family, an experienced Los Angeles slip and fall lawyer may be able to help. Any steep increase like this is disturbing. But it’s even more troubling because falls were already one of the leading causes of death and injuries among senior citizens even before the sharp rise was announced. According to the study, more than 30,000 elderly people died from falls annually in the U.S. during the 9-year period. Seven million people over 65 years old are injured every year from falls. The category of “unintentional injuries” is #7 among all causes of death in older people. Falls constitute a large proportion of the category. Death rates stemming from falls rose 3% annually on average for people over 65. They rose 4% for people over the age of 85. There were significant increases in deaths in 30 states, including California. Eleven states saw no increase or a decrease in fall-related death rates. Several states reported mixed results over the study period. Another troubling indication of the study was that fall-related death rates in people over the age of 65 could continue to climb in the future if current trends persist. Researchers forecast that if climbing rates of fall-related fatalities continue, over 60,000 senior citizens will die due to falls in 2030. Why is the rise occurring? Many observers believe that the increase in longevity among the U.S. population means that people are living longer than they once did. Chronic conditions often go along with age, and many chronic conditions, such as diabetes, stroke, arthritis, and Parkinson’s disease, can making falling more likely. Medications that cause dizziness or sleepiness may also be a factor. It’s important to note that many environmental hazards can be removed or replaced with safer alternatives, reducing the chance of falls in the elderly. Loose area rugs should be secured or removed. Grab bars should be installed in showers and bathtubs. The elderly should wear shoes that have nonslip soles and either avoid stairs or exercise caution when walking on them. If you have questions on liability and slip and fall attorney can be consulted for a free legal case review. Deaths and injuries in the elderly caused by falls are a tragedy, in part because they are very preventable. 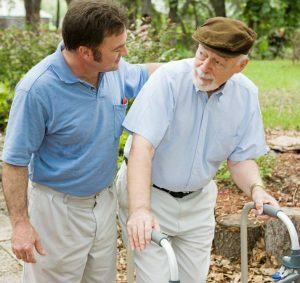 Have you or an older loved one suffered from a slip and fall due to the negligence of another party? The Ellis Injury Law Firm fights aggressively for victims of slip and fall accidents in the Los Angeles area. Please contact an LA premises liability lawyer at our firm today at 310-641-3335. Get the benefit of our more than 20 years of experience litigating fall injury cases in southern California. Our initial consultation is complimentary.